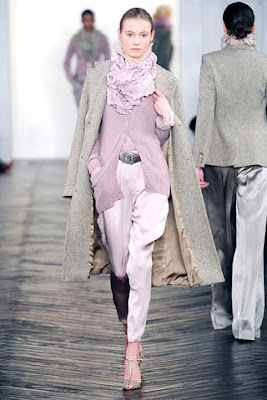 Consistently one of my favourite designers, Ralph Lauren demonstrates beautifully how to mix different fabrics together to give a really classy look; I love the combination of tweed suiting, soft pastel knits and luxe satins in neutral and pastel tones. Translate this into hijabi style by layering a fine knitted cardigan over a satin shirt and pairing with a smart tweed or herringbone maxi skirt. Providing another breath of fresh air, grey is the new black when it comes to dressing smart. These looks below restrict black to an accent colour in shoes and accessories, and combine textured grey trousers with longer length jackets which are becoming more easily available on the high street; keep an eye out for my top finds coming soon! I love Ralph L. and especially the shiny silk trousers. Unfortunately they are really expensive, around £500. I tried them on in Harrods. At the moment I'm searching for a good pair of wide trousers. Any advice? Love the Ralph Lauren clothes! Its modern with a classic touch. So sophisticated! I'm loving the use of jewel tones this season. The brushed silvers, golds, bronze, and coppers are soooo gorgeous. I wish these were always in style! I love that emearld green suit and then the silver and lavendar one is so pretty. i like your taste. very classy! Love them ...especially the bottom six, since they are classy, have unstated elegance, and because they are modest and cover where they should--ie: covering the legs to ankle and the 'bottom' area to the lower hip.